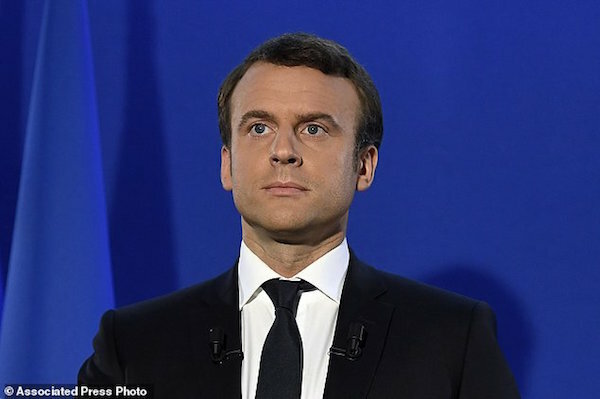 Emmanuel Macron was elected president of France on Sunday with a business-friendly vision of European integration, defeating Marine Le Pen, a far-right nationalist who threatened to take France out of the European Union, early projections from five polling organisations showed. The projections, issued as polling stations closing at 8 p.m. (1800 GMT), showed Macron beating Le Pen by at least 65 percent to 35 – a gap wider than the 20 or so percentage point margin that pre-election surveys had pointed to. The centrist’s emphatic victory, which also smashed the dominance of France´s mainstream parties, will bring huge relief to European allies who had feared another populist upheaval to follow Britain’s vote to quit the EU and Donald Trump’s election as U.S. president. The 39-year-old former investment banker, who served for two years as economy minister but has never previously held elected office, will now become France’s youngest leader since Napoleon with a promise to transcend left-right divisions.